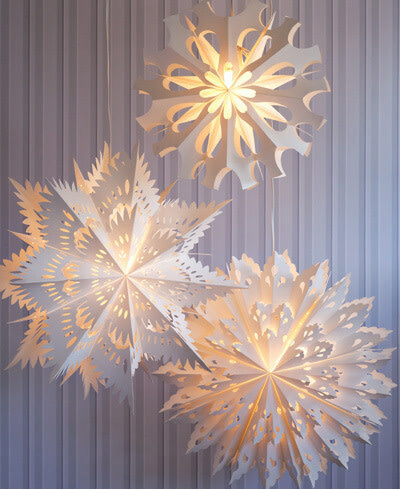 Paper snowflake lamps cast snowflake shadows inside, even when there’s no snow outside. Cast snowy shadows even if there’s no snow outside. Much to my chagrin, the snow falling in Portland recently has not quite graced what the meteorologists call the “valley floor.” No, sadly, the snow we’ve seen in lowlands backyards like mine has barely lasted the night. But, on the bright side, that’s all the more reason to spring for the set of paper snowflake lights I’ve had my eyes on since before the winter solstice. The set of three ranges in size from about 18” to 25” in diameter and 6” to 8” in depth. Each lamp hangs from its own 12 foot long cord; a 25-watt bulb also is included for each. They require some assembly, but then will cast delicate shadows year round, regardless of whether the world outside is a winter wonderland of white. A stairwell with blank walls would be a perfect location for these never-melting snowflakes – or a cozy corner of a child’s room. They are whimsical and beautiful, which is just what we need this time of year, when the days are still short and the light is low. Let it snow, let it snow, let it snow! And let there be light.